STATEWIDE -- Ornamental pear trees, most commonly known as Bradford pears, have been a popular landscaping tree in Indiana for decades. So popular that they are crowding out native Indiana trees. For that reason, the Indiana Department of Natural Resources encourages homeowners and landscapers to avoid planting such trees and to replace them when possible. “Over time different varieties of pear have cross pollinated in our urban areas, allowing them to rapidly spread into our natural resources,” said Megan Abraham, director of the DNR Division of Entomology & Plant Pathology. Cultivated forms of this invasive species are most accurately known as Pyrus calleryana or Callery pear tree. 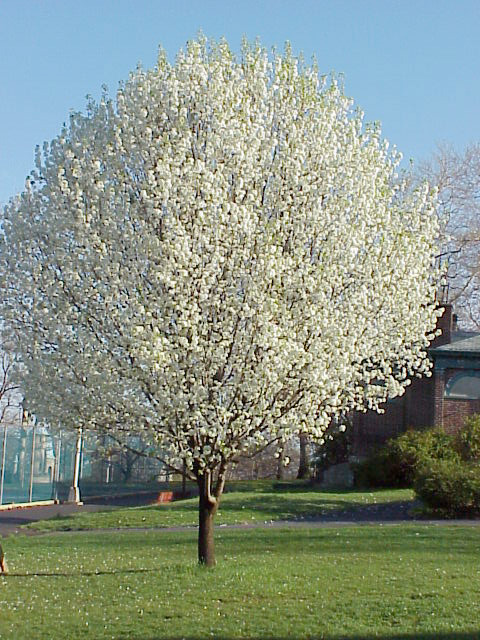 Commonly available ornamental pear cultivars, all of which are invasive and should be avoided, include Bradford, New Bradford®, Cleveland select, autumn blaze, Aristocrat®, capitol, Chanticleer®, and dozens more. In addition to being invasive, these cultivars, which are known for their striking white flowers, typically don’t last long. They are structurally weaker and more easily damaged by storms than native trees. Carrie Tauscher, urban forestry coordinator with the DNR Division of Forestry, says that evidence of the trees’ rapid spread is easy to see. Stopping the spread of this invasive plant means selecting alternate trees for yards and forested property. The best tree to replace any invasive tree species is one that is native to a particular region. If you are looking for an alternative flowering tree for Indiana, serviceberry trees, which have similar white blooms in the spring and fruits that attract wildlife, are one option. Eastern redbuds, which grow quickly, with eye-catching lavender flowers in the spring are another option.